Together with looking after residential and car locksmith services, we also provide commercial locksmith services to businesses in and around the Bondi Junction area. If you are the proud owner of a new business premises you may have some concerns about its level of security. Our commercial locksmiths can perform a thorough security check on your property. This evaluation highlights any potential weak points where intruders may be able to gain unauthorised access. Give us a call now to arrange an inspection. Unless you have a restricted key security system, there is no way of knowing who has keys that can access your business. For better security, we recommend a restricted access system to business owners. This system ensures owners know exactly who has keys and what levels of access they have. Without owner authorisation, key copying cannot happen. 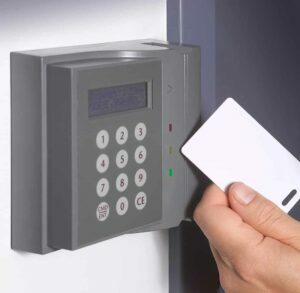 Through the use of electronic access control systems you can take your security one step further. You can set different levels of access dependent on the time of day and position of each employee. For added security, you can also monitor employee movements throughout your whole site. If ever any keycard is lost or stolen you can simply revoke access for that particular keycard. This level of flexibility is unachievable with metallic style keys. Does your company deal with large sums of money or precious valuable items? If so you need to invest in adequate safes and or vaults to store these items. Our commercial locksmiths sell, install, inspect and repair safes and vaults of different sizes and security levels. Give us a call now to arrange an inspection from our professional commercial locksmiths for all your business needs. Or check out our other mobile locksmiths services. Copyright © 2015-2019 Bondi Junction Mobile Locksmiths. All Rights Reserved.